July 27 in Moscow will be the launch of the project "TurKultur." People will now be able to move between the museums of Moscow on scooters. An inter-museum navigation system will link the Moscow Manege with a number of other museums. This is the essence of the new project, "TurKultur," giving people the opportunity to visit several museums in the center of the city in one day, moving from one point to another by scooter. At the same time, participants willbe learning about all the sights that they will see along the way. The tour offers 10 different routes in total, each lasting from anywhere between 15 minutes and 120 minutes. “Come to the exhibition and the scooter will be available in the Manege,” says Alexander Uskov-Kell, curator of the project. 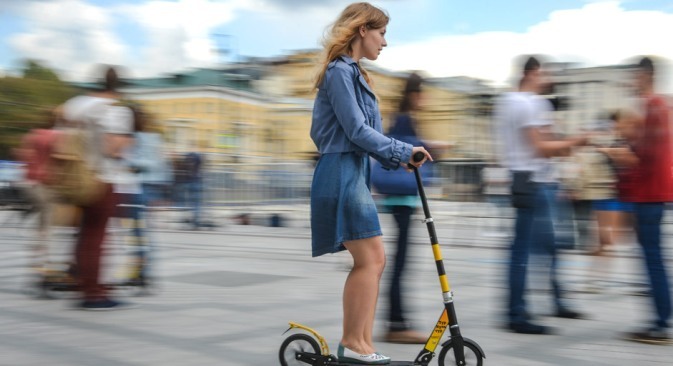 Hours: July 27–October 22, 2013; Daily 12 p.m.–9:30 p.m.
You will be given a scooter on a deposit of 2,000 rubles ($60), to be used free of charge. The operator supplying the scooter can advise you and show you the route. Together with the Manege on the project are the Pushkin Museum of Fine Arts, the State Museum of History, the Shchusev Museum of Architecture, the Moscow Museum of Modern Art, the Na Solyanke gallery, the Triumph gallery and the Cultural Foundation Ekaterina. "If you do not want to go to the next museum, you can drive by or go to a cafe. The main thing is to return to the Manege on the same day, return the scooter by 9:30 p.m. and get back your deposit,” says Uskov-Kell. To leave the scooter at one of the museums participating in the project is impossible. Impossible for now, says the curator: "This is a test — a pilot run — but, before the end of October, we will understand how it all works. If the project will be popular, if we see that people like it, next year there will be more points for scooterdrop-off." On the starting day of the project, a hotline through which you can not only report damage to a scooter but also ask questions about the project will be opened. The hotline phone number will be listed on the Manege website in the "TurKultur" project section, as well as at the front of the operator issuing the scooter. There, on the site, you can find out how many free scooters are available and plan trips in advance. According to Alexander Uskov-Kell, there is nothing like "TurKultur" in the world. The idea came to him after buying his own scooter: "I have a family, I work in the Manege, and I recently had a scooter. Once these factors came together, I realized that this is what you need to move around between museums. In four months we have launched a new, Scooter interface of interaction with the public." Uskov-Kell believes the future of the project is bright: "The main thing is that, this year, we supported the project, as was demanded. The following year, I think there will be more than 20 participating museums; and then, I hope, we will be the world's first network of scooter cultural routes and points-of museums. An integrated ticket and discounts on exhibitions as a bonus for using the scooter—it's all to come. " Many fear that the project "TurKultur,"set to run July 27 – October 22, will not pass the test of Moscow in the fall. Uskov-Kell rejects these concerns: "It is exactly the same as in Moscow, and even more difficult weather conditions are in Finland, Estonia and Norway, where people ride their scooters year-round. Our scooter is unusual: It has a special suspension and wings that are not afraid of puddles. Even in the rain fall you will be able to ride it as comfortably as in the summer." About the scooter: "The scooter is great; for the center of Moscow it is ideal. It has a shock absorber, which means that, when you are driving on the cobblestone, it springs back and you do not feel wild shaking. It has a standard scooter brake that is pressed by foot, a footrest, and also it is able to fold, so you can enter a cafe, the subway, the bus, if required. It is compact, convenient, light enough — compared to the bicycle, for sure. A comfortable speed for the scooter in the city is about 12-15 kilometers per hour (7-9 miles per hour) — that is, 2-3 times faster than on foot. " About the route: "The center of Moscow is not the most convenient place for a scooter. The most difficult thing is the curbs. But the scooter is not a bike, and you can always get away with it and put it on the sidewalk. "